The Pizza Hut on Fruitvale Avenue now accepts EBT cards. 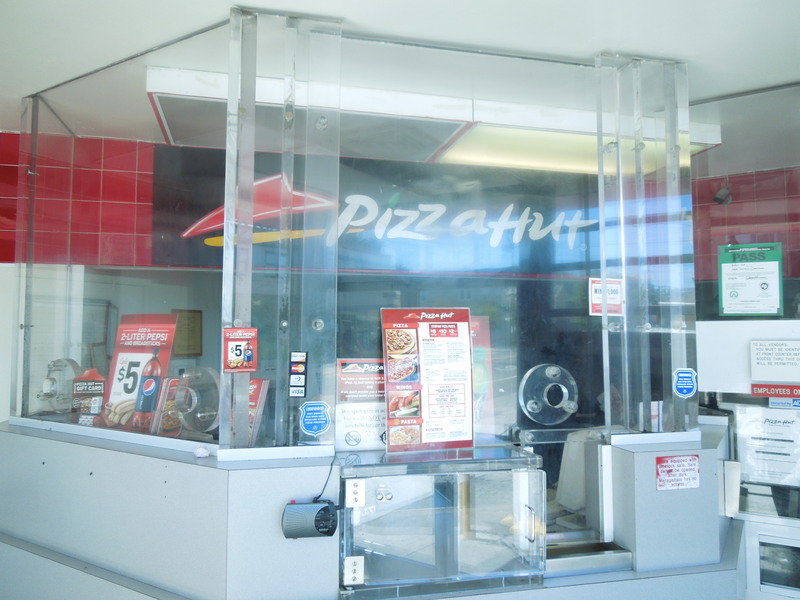 But the two-inch thick bulletproof glass and absence of dine-in seating make it very unwelcoming. By Michael Holland, Oakland Voices 2012. Alameda County residents who are receiving food stamps, cash and other forms of public assistance as an Electronic Benefits Transfer (EBT) can now purchase prepared meals at Pizza Hut and Dorsey’s Locker – two establishments that didn’t accept them a month ago. But they have to be elderly, disabled, or homeless. August 1st was the first day that Pizza Hut began capitalizing on EBT. With two participating locations in Oakland and seven more throughout the East Bay, Pizza Hut should see an increase in sales. The Mayo Clinic’s “Living with diabetes blog” published a very unfavorable report on the relationship between pizza and diabetes in 2009. Although pizza can at times be rich in protein, vegetables, and complex carbohydrates, it has also been linked to obesity and bad cholesterol. The best things that Pizza Hut have to offer are hot wings, deep dish pizza, and sodas galore. Not good. Dorsey’s Locker has been in business since 1941. Their menu is comprised of soul food with a New Orleans theme. The food is delicious. It is also very fried and very sweet – rich in sodium, sugar, and fat. I personally grew up eating soul food. Today, I am slightly overweight and I am also a diabetic. I attribute my diabetes to the diet I grew up on – soul food. The traditional, Down South type of deep-fried dinners that are served at Dorsey’s are what many black families still eat. Like I said, the food is delicious. But all that flavor comes with a price. A lifetime of eating such foods can lead to a lifetime of health problems. The food at Dorsey’s Locker is also slightly overpriced for someone trying to survive off of the meager allotment of food stamps they receive. The average meal and drink at Dorsey’s runs about twenty dollars. At those prices, a recipient can only afford to eat for maybe a week. The benefit amount varies, but according to the Alameda County Social Services website, the average applicant receives $73 a month in food stamps. If the person is head of a household the size of one they can receive up to $200. In the 1990s, Subway sandwich shops accepted food stamps in Oakland. They no longer do. Subway might be at least a slightly healthier option than pizza or soul food (although some of their food is also high in sodium ad fat). But health has nothing to do with the bottom line. Pizza Hut and Dorsey’s Locker did not start accepting food stamps to promote health. It seems to me like they accept stamps now to increase profit. That unhealthy food isn’t helping anyone but themselves. Programs like CalFresh (once officially, and sometimes still, known as Food Stamps), and General Assistance were put in place to help those in need feed themselves until they get on their feet. If those in need are eventually diagnosed with diabetes, heart disease or other illnesses as a result of poor diets, state and federal governments may find themselves spending heavily on healthcare in the near future. Fast food and soul food are parts of American culture. Knowing that, these two establishments have made a choice to capitalize on the EBT market. “Polite Policing” which makes reference to my family business, Dorsey’s Locker. elderly, homeless, and disabled populations in the area. the ever present issue of hypertension in our community. Locker certainly falls into that category. This piece provides interesting insight of a topic that extremely common but never spoken. Well done Mr. Holland. I am looking forward to what else you will be doing.